Puerto Rico Gov. Ricardo Rosselló continued to fire shots at President Trump on Thursday — warning that “if the bully gets close, I’ll punch the bully in the mouth” — following a reported spat at the White House between his top aides and US officials. Puerto Rico officials were in Washington on Thursday trying to schedule a meeting with Trump to talk about what he reportedly said and discuss the island’s increasingly grim situation following several failed attempts to do so, according to CNN. “Your governor is f***ing things up,” said trade adviser Peter Navarro, according to sources who attended the meeting and spoke to CNN. White House officials denied making the comments and said they were working to connect with Rosselló and his aides. Trump’s comments about the Hurricane Maria relief efforts came Tuesday on Capitol Hill, according to the Washington Post. 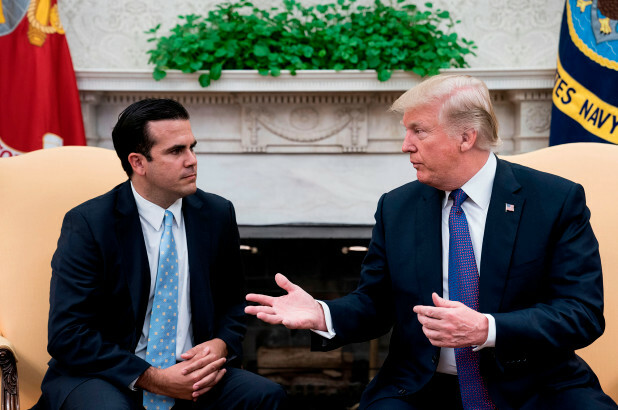 Rosselló called him out later that evening, saying his suggestion to cut aid was “below the dignity of a sitting President.” He reiterated the statement Thursday during his interview with CNN. “Electric and all infrastructure was disaster before hurricanes,” Trump said.